Rain, or a lack of it can plague farmers for decades when weather patterns shift, but new rural development initiatives are seeking to provide farmers with knowledge to resist the advancing effects of climate change. Farms in the province of Al Haouz, near Marrakech, have benefited from Moroccan government grants to develop subterranean drip irrigation systems that reduce the amount of water required for plants. The International Fund for Agricultural Development, (IFAD), provides technical support and helps to teach farmers how to increase and diversify their products in a sustainable way. Abdeslam Batrah has been working these lands since 1987. “We have gone through hard times. During those hard times we used water from the Saquia river and it was a difficult process because it was time consuming, it didn’t yield much water and it was expensive. Now, since the well was drilled, we have started benefiting more. Because of the olives, we’ve been able to have a source of income. And because of the fava beans and green peas, we’ve been able to live off of them as well. But in 2000 and before, times were very difficult and the droughts had a negative impact on things,” he says. In areas like these the government has teamed up with international organizations to strengthen communities’ resilience to climate change by also protecting soils from erosion. 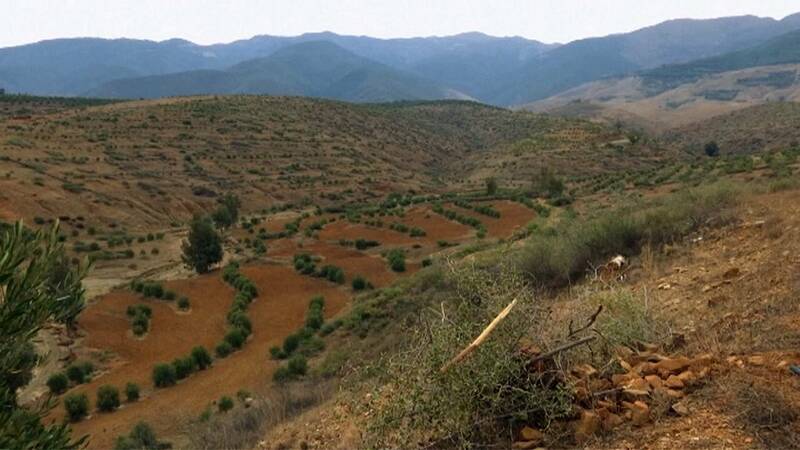 Where torrential rainfall has torn deep ravines into the landscape, destroying vegetation and sending sediment down into the valley, mountain terracing has been planted with thousands of trees. Abdeslem El Fouzi is an agricultural engineer from the government who worked on the project. “It’s important because there is lots of rainfall, there is torrential rain, and there is a loss of soil. So to keep and stabilize the soil we used fruit trees. The restoration you see here is a joint action between agricultural development and soil conservation activities, through these terraced fields and fruit trees,” he says. With more than 60% of the Moroccan population now living in urban areas, another challenge has been to provide incentives to stem the flow of people towards urban centres. The IFAD has been working to teach farmers how to create cooperatives to better market their products. In this olive oil cooperative, farmers manufacture their own olive oil and other by-products such as soap. The cooperative also produces honey and meat. New jobs have been created. For rural women, the benefits are huge. “When new agriculture was introduced into the region with the introduction of new technological tools, it has made things easier in terms of the production of olive oil. It has improved the way we extract the oil and it sells well in the market. And rural women have benefited, she now has her own source of income. She doesn’t wait for her husband to give her anything, and thankfully for these efforts – olive oil, honey, meat, soap – now women don’t have to rely on their husbands to buy medicine for their children for example or to pay for their schooling. She has money in her pocket,” says the President of the Female Agricultural Co-Operative Najia El-Ghouet. that the fight against climate change was an “urgent duty“ and “irreversible”. The Paris Agreement has been ratified by 111 nations so far.